When one of the opening scenes to a game is as follows: a 2D cartoon of gandalf on the bridge of Kazad-Dum shouting “you shall not pass” shortly before being crushed by a bolder with a contented looking face on it, well then you know that it will undoubtedly be one of the strangest games you will ever play. That is a fairly accurate description of what you experience when playing Rock of Ages and it does set the scene for stranger things to come. The game begins as you watch a 2D cartoon – which is described on the site itself as having “Cartoon Violence [and] Crude humour” – of the mythical Sisyphus attempting to roll his boulder up a hill and continuously failing. Then deciding to use his boulder as a weapon and attack his tormentors. The introductions to the levels continue in this vein throughout, with everything from a zombie Plato and Aristotle on the rampage and a monster hunter squashed by Dracula’s boulder, to an angry Napoleon playing on a rocking horse. But enough about the cinematics – as strange and entertaining as they are, it is primarily a game and so the gameplay is what is important.The gameplay combines tower defense with first person control of a boulder. The idea is to destroy the enemy castle-gates first and crush the mythical or legendary leader inside who screams loudly as you batter down their defenses then makes a squelching sound as your happy looking bolder rolls over them. 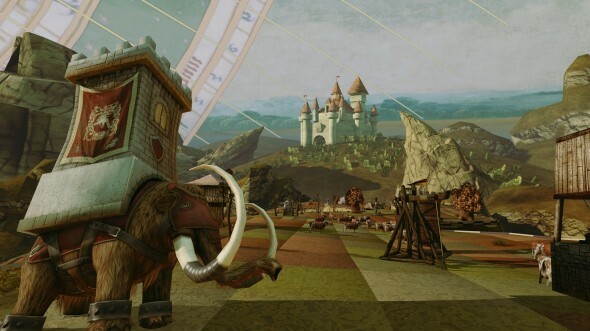 The castles are located at the bottom of separate slopes of varying length and shape with obstacles such as giant mammoths, rivers and sheer drops on either side. The idea is to last long enough to batter down their gates and as your minions prepare the next boulders, rush to spend your income on defenses to place down your own slope which vary from hot air balloons to ballistae to piles of bombs and much, much more. The fast paced placement of towers and frantic rolling gives a surprisingly tense and often frustrating experience, and with local and online multiplayer to add to the game, you will not be bored by unchallenging or unoriginal gameplay.